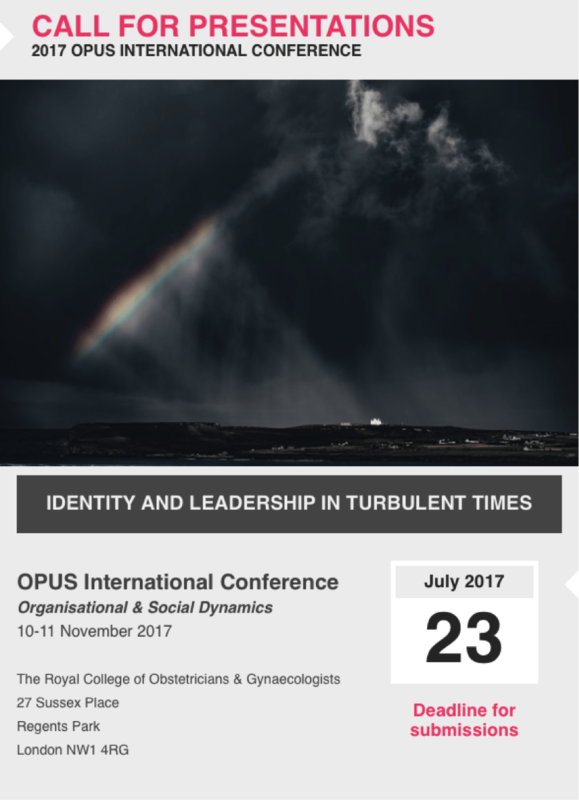 Submissions are invited for presentation at the 2017 OPUS International Conference. The conference theme is Identity and Leadership in Turbulent Times. Presentations should explore organisational and social dynamics from a psychosocial perspective, showing some relevance to the conference theme. 24 presentations will be selected to be given in four sessions of 6 parallel presentations over the two days. You must be available to present on either day. We are particularly interested in receiving submissions from presenters with creative approaches to our theme who can offer engaging ways of catalysing action and understanding of the issues and dilemmas they raise. At the conference, each presenter will have 90 minutes to explore their ideas with up to 20 participants. We will provide a facilitator for each presenter, though you are very welcome to suggest someone yourself. (where applicable) the name of any person you would ideally like to facilitate your presentation (Note: if English is not your first language, you may wish to nominate a native English speaker as your facilitator). The deadline for submissions is 23rd July 2017. Presenters whose submissions are selected will be notified by 6th August 2017. Agreement to present should be confirmed by payment of the conference fees by 3rd September 2017. We will then liaise with you to finalise the presentation details for the delegate pack by 16th October 2017. For further information about the conference or submitting your proposal, email conference@opus.org.uk, or telephone John Wilkes, 2017 Conference Chair on +44 (0) 208 883 6925.